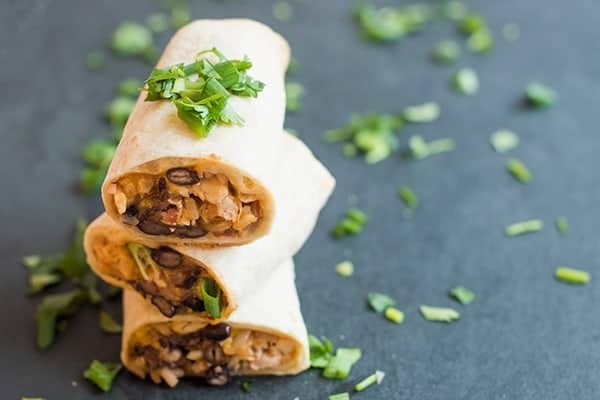 Stock your freezer with these hearty and nutritious burritos filled with tender chicken, black beans and brown rice. We survived our first week back to school and it went by in a blink of an eye! I’ll tell you what, this busy back-to-school season is no joke. It’s definitely a little intense and a bit of an adjustment for our family. Since my kids don’t go to daycare, this is the first time we’ve ever had to set an alarm clock or be anywhere at a specific time every single morning. I still get paranoid I’m going to forget to pick him up on time. Can you tell he’s my first? Needless to say, I’ve been meal prepping like a boss. Not only does preparing food ahead of time reduce stress but it’s easier on our wallets and our waistlines which is always a win win. One of the unexpected advantages of our Cancun vacation was discovering just how much my boys LOVE Mexican food. 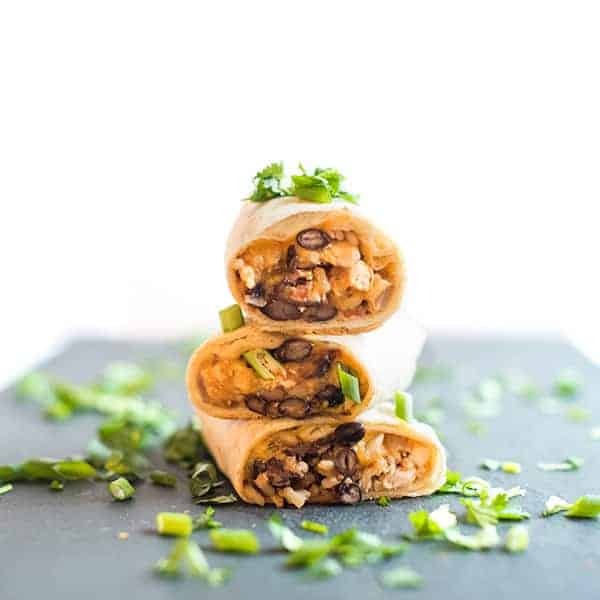 Assembled in just minutes, these make-ahead chicken and black bean burritos are way more delicious than anything you’ll find in the grocer’s freezer aisle. Above all, making your own freezer burritos is much more nutritious because you can control the quality of ingredients. Speaking of, if you or one of your family members has a gluten intolerance, we love using Toufayan gluten free wraps in lieu of flour tortillas. They come in a wide variety of flavors including Spinach, Garden Vegetable and Savory Tomato. When making these burritos, I used the original flavor. To make them even more pliable, I like to gently warm them for a couple seconds on each side over an open burner. Don’t worry if they don’t look perfect, they will hold their shape really well since they will be heading into the freezer. 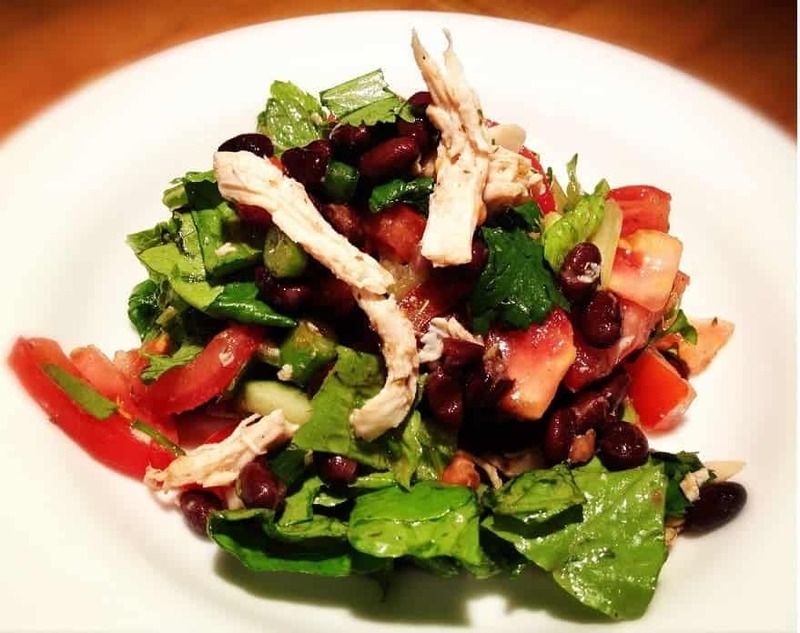 We made ours with leftover shredded rotisserie chicken, black beans and brown rice but feel free to mix and match with your favorite fillings. Pulled pork, kidney beans or quinoa would all be tasty ideas. As always, this recipe is more of a guideline than a specific recipe you must follow so get creative and have fun in the kitchen. 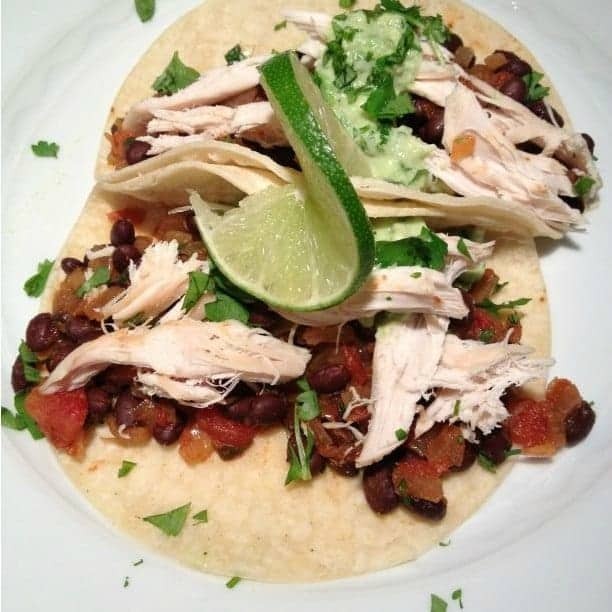 In a large bowl, mix together chicken, rice, beans and salsa. To roll burritos, bring the bottom over the filling and then fold left and right side while you tightly roll the rest of the tortilla or wrap. Continue until all of the tortillas are filled and wrapped. 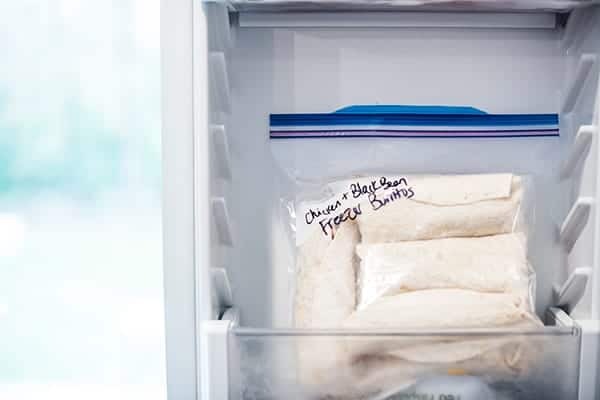 To freeze, wrap each burrito individually in plastic wrap and place in a large resealable plastic bag before placing in the freezer. To reheat, simply microwave until warm, about 60 seconds. Disclosure: Toufayan has compensated me for my time to develop this recipe. Thank you for supporting the brands that make The Lemon Bowl possible. All thoughts are my own. 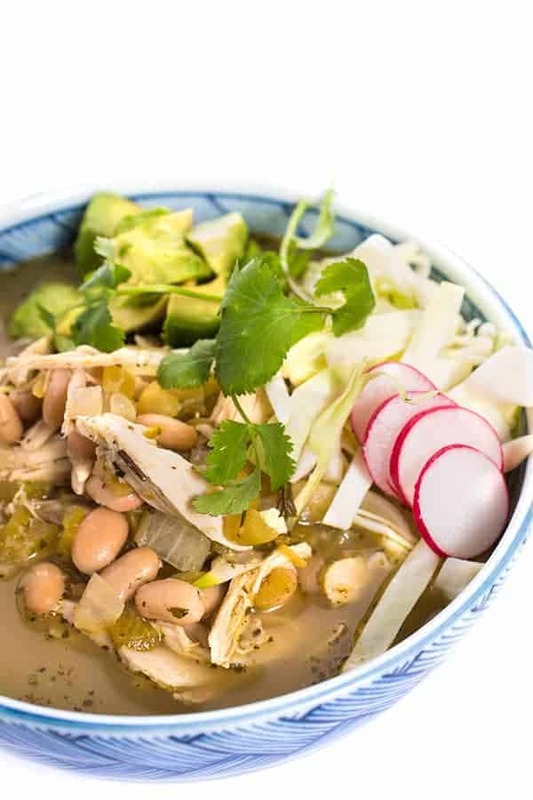 More Healthy Mexican Eats are only a pin away! Just made these with quinoa as you suggested subbing, along with black beans and added in some asparagus. Having a baby soon and your recipe sounded like a galactagogue haven :) they look great, can’t wait to have one! Oh I’m so glad!! I hope you enjoy them!! I’d love to make and freeze these,but was wondering how long they need to be heated in the microwave since we are dealing with chicken? And does heating them till sufficiently hot affect the tortillas ie harden them ? Thanks . I would say 1-2 minutes would be good, depending on your microwave. Everything is fully cooked inside so it’s really a matter of making it warm enough to eat. Ok, this is probably a dumb question but it doesn’t state anywhere. It say add chicken,rice,beans and salsa in a bowl, my question is the rice cooked? YES!! I’ll add that to the recipe. :) Cooked rice!! Hi Sara, I just looked and it does say Cooked Rice. :) Do you not see that? Great Recipe! Question – do you recommend removing from plastic wrap before microwaving? Thanks! Will be looking for more make ahead ideas! Yes I always remove the plastic! I hope you love them! Thanks for this awesome idea! How long would you say the burritos will keep in the microwave? I mean in the freezer*** haha it’s been a long day. haha!! Not too long in the microwave – hehe!! They’ll keep for 3 months in the freezer! Love all of your recipes! Can you please recommend a reliable and accurate nutrition calculator to calculate nutrition of recipes? Thanks!! I use MyFoodDiary.com! Love it so much! I don’t know why I don’t make bean burritos all the time – they’re my favorite! Also – mine is in 5th grade and I still worry I’m going to forget her, ha! haha that’s so funny – I’m so glad I’m not the only one worried about forgetting the pick up!! I made these last night, after dinner and dishes. I made them on 12inch tortillas since my darlings are adults 24 and 21, the problem is that I am left -2 because as I was making them they had one each.. I never bought the already frozen ones, who knows what’s inside!! but I felt so happy to make these. Kids, well mine are adults but they play lots of sports and forever hungry. Thank you so much Liz for this great post. You are so right – who even knows what is inside the freezer ones!! So glad you enjoyed this!! Another idea if you ever have leftover filling – we spread it out in a casserole baking dish and top with shredded cheese and bake. The kids devour it! Back when I was single, I made and froze burritos all the time. 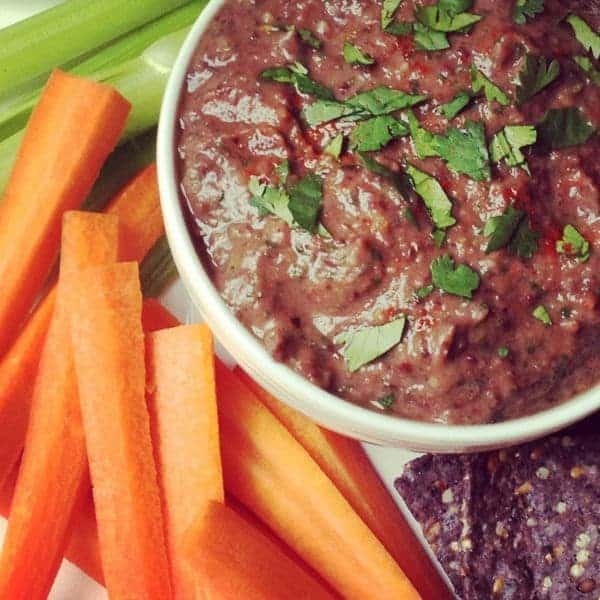 But I haven’t done it in forever – I’m totally trying these for easy weeknight meals!! Oh my gosh that is too funny and so SMART!! Would it be weird if I told you I’m imagining myself eating these for breakfast? Because that’s happening. Umm… that sounds genius to me! Burritos for breakfast!! LOVE freezer burritos. Make them all the time! These boys are eating me out of house and home lady! I need to stock my freezer!! Oh yummy! These sound and look really good! Back to school gets easier and harder every year! It’s a fun time of year, and eventually you get into a routine. Ha – setting alarms, that’s never fun. These burritos are awesome. I don’t know why I haven’t done this yet. Would make life a hell of a lot easier that’s for sure! Seriously that is how I felt- why haven’t I been doing this for years?! I watched you on WoodTV this morning–great job, Liz!!! This is the recipe you demonstrated, right? It looks so good, I’m going to try it! We grew black turtle beans in the garden–I think I’ll cook some and use those! And….you’ll get used to the new schedule in no time too! !❤️ Our kids have been married and out of the house for many years and I still wake up at that old schedule time every morning!!????????. Thank you so much for tuning in to my segment! Yes this is the one I made! Great idea to use your turtle beans!! I need to fill my freezer with these burritos for those crazy nights when I just don’t feel like cooking. 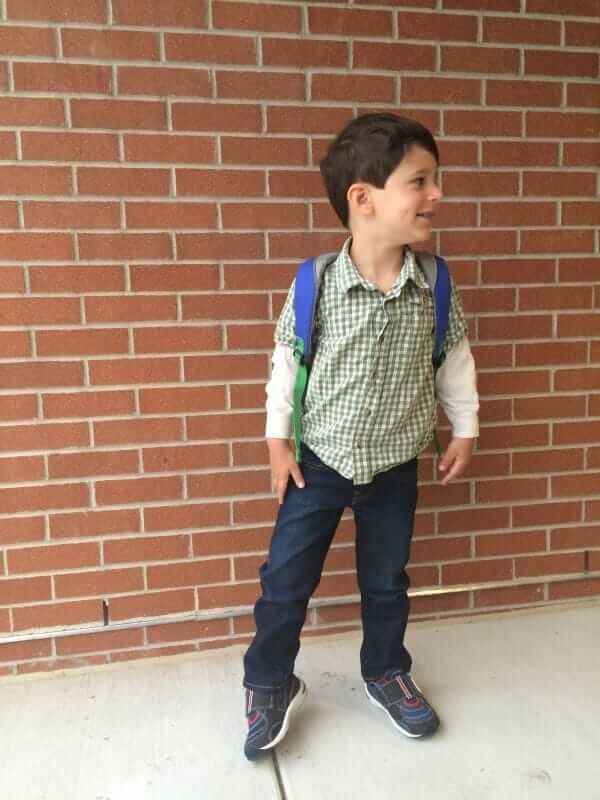 And little Asher looks so cute all dressed up for preschool! I need you to show me your frozen meal ways! 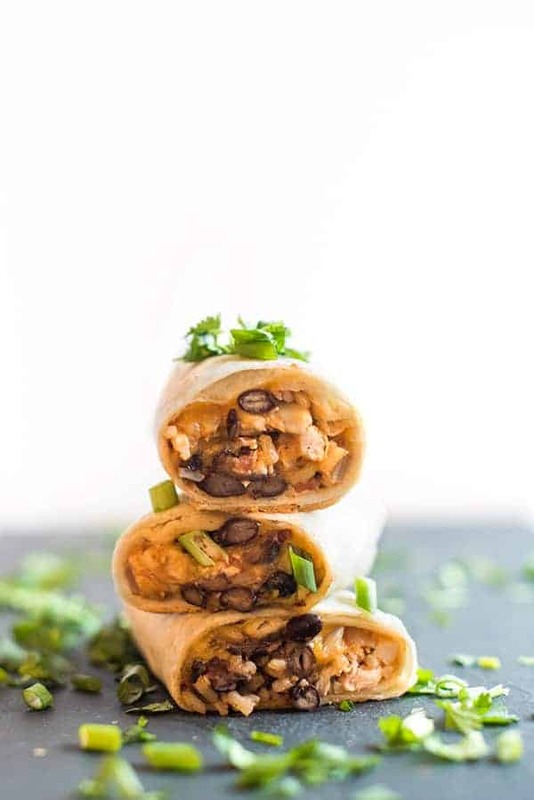 This chicken and black bean burrito looks delicious! Genius idea Liz! I’ve always made breakfast burritos ahead of time but never thought about making lunch or dinner burritos. PS. Asher looks as sweet as momma! It’s so funny -I always think to do breakfast ones too but the TV studio doesn’t have a heat source to make eggs hahaha!! Aww thank you! Girl why haven’t I been freezing burritos for ever!?! I am seriously hooked!! I am so on board with anything freezer friendly! Meal planning really is such a life saver, healthier and just perfect for back to school season. 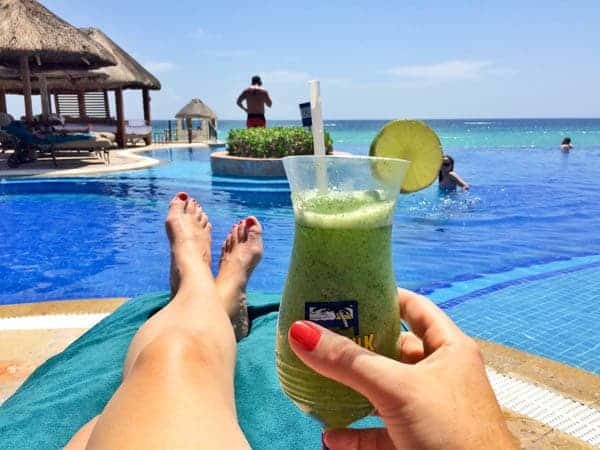 These wraps look great–I need to try this brand…it is new to me and looks great. I hope you’re having a great time in OH! !